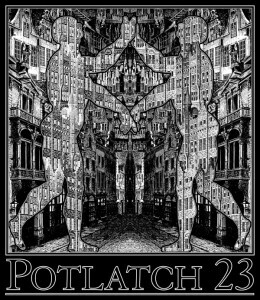 Potlatch 23 happened on February 21-23, 2014 in the Sainte Claire Hotel. As the chair, I’d like to thank everyone who attended the conference. It was great to see how it was in full swing even before opening ceremonies. The program was a success. I didn’t see as much of it as I wanted, because I was running around, but I liked what I saw, all the panels were well attended, and I heard a lot of discussion continuing between panels and on into the evening. The program ideas were suggested and voted on by members of the conference, who also volunteered to be on the program. This was an experiment in self-organization. My thanks to everyone involved for making it work so well. The Clarion West Benefit Auction was a big success. It raised over $1700, which is above average and particularly impressive given that Potlatch 23 had fewer members than most. Only two unsold items were left at the end. Thank you to Dawn Plaskon, Cindy Scott, Linda Deneroff, and Peggy Rae Sapienza for organizing, and to auctioneers Ellen Klages and Tom Whitmore for a very entertaining performance. There were many positive comments about the consuite. We have to give a huge thanks to Karen Schaffer who had to overcome many obstacles including key staff members who could not attend, and not even having a room for the consuite until a week before the con. Thanks also to Rich McAllister, Mike Ward, Ruth Leibig and Donya Hazard White for their help in making the consuite such a welcoming and comfortable place. Randy Smith organized at-con registration. Unfortunately, because of a funeral that came up at the last minute, Randy was not able to be at most of the con. Thanks to Glenn Glazer and Amy Martin for putting in a lot of extra hours at the registration table and making it work. Thank you to Lucy Huntzinger for the program book and David Bratman for the monumental local restaurant guide. The dealers room had Other Change of Hobbit, Cargo Cult Books, and PM Press, offering books, books, and more books. It went over very well with the Potlatch crowd. Thanks to David Gallaher for organizing it. The writers workshop was well attended, with eleven participants. Thank you to Jude-Marie Green for organizing, and to David D. Levine, Rachel Holmen and Cliff Winnig for serving as critiquers. 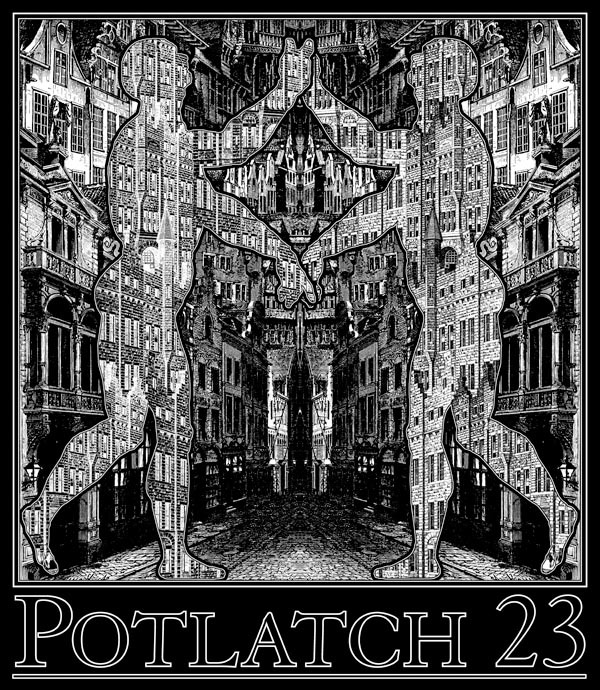 The Potlatch 23 T-shirts featured another stunning design by Freddie Baer. There is one shirt hasn’t been sold yet, so it now is a rare collector’s item. Look for it at the Clarion West Benefit Auction at a future Potlatch. There will be a Potlatch 24. Watch this space, and subscribe to the Potlatch [announce] mailing list for information. See you next year in Seattle! This entry was posted in Uncategorized on March 1, 2014 by Tom Becker. There are thirteen excellent ideas for programs, suggested by the members of the convention, and now it’s time to pick your favorites. We have time for seven or eight program items, though if more topics get a lot of votes then we’ll try to squeeze those in as well. We also hope you’ll participate in the program by volunteering to speak or moderate a panel. But no matter what, please let us know what you’d like to see. The deadline for voting is January 31st. Here’s a taste of the many museums located near the convention. The Sainte Claire Hotel is beautiful and it’s in a great location in downtown San Jose. You’re going to want to stay there. Reservation information is at http://www.potlatch-sf.org/hotel/. Potlatch will have a banquet brunch on Sunday morning, catered by Il Fornaio. They do a really good brunch. Banquet tickets are only $25 at http://www.potlatch-sf.org/registration/. Last year, Potlatch 22 was held in conjunction with Foolscap 2013. It was fun. This year, I’m coming back to Foolscap and hosting a Potlatch party. Foolscap 2014 is January 31st – February 2nd. in Redmond, Washington. Check out http://foolscapcon.org/ for info. I hope to see you there! This entry was posted in Uncategorized on January 29, 2014 by Lucy Huntzinger. Thank you to everyone who suggested program ideas. Now we need to decide on the program. Please go to the Program Survey page and fill out the survey form. There are two sections, one where you vote for the topics you’d like to see, and another for the ones you could be on as a panelist or moderator. This entry was posted in Uncategorized on January 25, 2014 by Tom Becker. The Sainte Claire fixed a problem with their reservation system. If you were unable to reserve a room for Potlatch, please try again. To reserve a room, use this link to Sainte Claire Hotel Reservations. This link is also updated on the Hotel page. This entry was posted in Uncategorized on January 22, 2014 by Tom Becker. The Tech Museum of Innovation is offering discounts for Potlatch members on admissions to the museum gallery, the Star Wars exhibit (priced separately), and the gallery/IMAX combo. Just show your Potlatch membership badge to the cashier. For more information, see our Local Museums Guide. This entry was posted in Uncategorized on January 17, 2014 by Tom Becker.